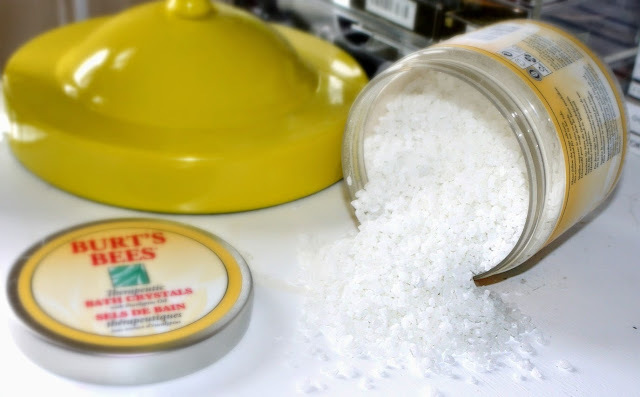 A random one for me, but today im going to profess my love for crystals, and no I don't mean those sort of crystals people believe give you healing and all that jazz, im talking about bath crystals, and those being the Burts Bees - Therapeutic Bath crystals! The reason Im wanting to discuss these today is because im never a person to purchase something twice, I have to REALLLYYY like something for me to even consider buying it a second time and if I do love it enough I need to share it with you! The way to use these are pretty simple you take a small handful and sprinkle them into a half full bath and that's literally it, no fussy bubbles, no nasty liquids pouring all over the bottle so you have to rinse it off, just a really simple product that gives you the most relaxing, aromatherapy spa style bath, they have a light scent which is very calming and I feel they really help me to breath clearly, and as I have mentioned in posts before as an anxiety sufferer, breathing clearly is a big deal for me and calming baths are a place I go when im feeling stressed or worried and these have been a god send for me, hence why I am onto the second jar of the stuff! The salts contain Eucalyptus Oil which is where the soothing calming scent comes from, if you are unwell or have had a long day these will work wonders for you, think of when you use vicks in a hot bowl of water under a towel and the refreshing feeling these give you, they instantly make me feel 10x better if im feeling run down and they soothe aching muscles a gooden! 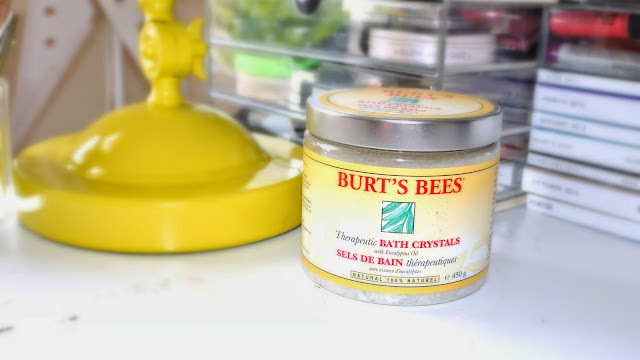 Another reason I love this product and the Burts Bees brand in general is because they are 100% natural meaning I don't have to worry about any nasties floating around in my bath with me! These are a really lovely bathtime treat so if you ever feel like a pick me up, grab a tub of these pop the taps on, light some candles and have a long soak in the bath (just don't fall asleep like I have nearly done many a time). Let me know if you have tried these or anything similar and how you got on! Followed you via bloglovin, please follow my blog back! wow thanks for the post I might just have to try this! I didn't even know they made these, thanks for sharing! I love bath salts.